Yay! It's another Any Size! Apologies for the couple weeks absence but it is now back with a bang! This week we look at how Disco Pants can be worn by any size! I really wanted to see this one as I wanted to see if this was a trend for all, or just the skinny minnies (jealous much, yes!). 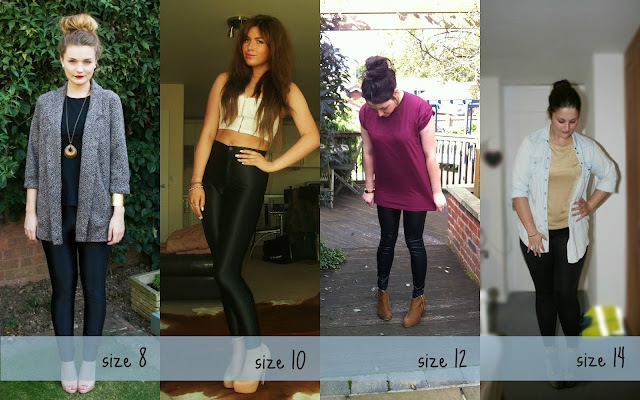 So take a peek and see how this weeks Any Size bloggers do it! Such a gorgeous girl in such a gorgeous outfit. I love the monochrome theme, and totally in love with this blazer as well/ She has teamed it with vampy lips. Yum yum! Look at those legs! I can't stop looking at them, they go on forever!! These suit her figure perfectly and she has teamed it for a night out with a fab crop top and gorge heels! a reappearance from the lovely Emily! Doing casual disco pants and showing me that even I could do disco pants! I love this casual outside and the colors! Showing no matter your size, you can still pull this trend off! Big thumbs up for this casual look. Rocking to fab trends of a denim shirt and disco pants! A big big thanks to all the girls for this week, go check out their blogs as they are all amazing!! If you'd like to be involved in Any Size please let me know! Just give me a shout on twitter and I can get you involved!! How do you style your disco pants? I really need to get myself some disco pants, I've been wanting them for years! I like this post. I have the River Island Tube Pants (their answer to Disco Pants) and I'm a size 18.